Die Martis, videlicet, 26 die Julii. E. Warwick's Letter to the Speaker, about stopping the Dutch Ships, for Restitution of ours taken by them; and the Difficulty of sending a Ship, &c. to the Relief of Duncannon Fort. Dutch Merchant-men to be released. Message to the H. C. with this Letter and Papers; and that the Lords are ready to proceed against the Lord Mayor. Committee of the H. C. go on with their Proceedings against him. Lord Mayor to be heard on Thursday. Message from the H.C. with an Order of Indemnity. Mr. Nichols (suspected to be O Neale) to be released. General Order for Indemnity for Voluntiers sent to the H.C.
Lord Brook indicted at Warwick, for executing the Militia, and opposing the Commission of Array. Leigh sent for, as a Delinquent. Message from the H.C. for the Lords Concurrence in the following Orders. Bp. of Ely to appear before the House. Message from the H. C. with a Reply to the King's Answer to the Petition of both Houses. The Reply to the King's Answer to be sent to the King. An. Order for the Judge of Assize to see who will avow the Herefordshire Declaration. A Declaration, to preserve the Magazine of any County by Force, if attempted to be taken away. The Reply to the King's Answer to the Petition of both Houses. Order for 20,000l. to be paid to Mr. Loftus, for the Affairs of Ireland. Order for Indemnity for Voluntiers of King's Lynne. Smith, Admiralty Marshal, freed from his Charge of the Magazine that came from Hull. Lieutenant of Ireland to grant his Commissions to the Earl of Thomond, for Horse and Foot. I gave you Yesterday an Account, by Packet, of the Stay of our Convoy by Trumpe, as also that I had stayed here Five Merchant-men of Holland, going for The Straights, till I knew your Pleasure, which make great Importunity to be gone about their Voyage. This Day Captain Blith is come in, and makes this Report I send your Lordship here inclosed; humbly desiring your Lordships and the House of Commons Directions, for the further staying or letting those Merchants-men, who would all come up to your Lordships with a Clamour against me for staying them; therefore I humbly desire your Directions herein. From aboard His Majesty's Ship The James, in The Downes, this 24th July, 1642. "To the Speaker of the House of Peers." Ordered, That the Speaker of this House do write a Letter to the Earl of Warwicke, for releasing the Holland Merchant Ships stayed by him in The Downes. To communicate unto them the aforesaid Letter and Papers received from the Earl of Warwicke; and to let them know, that their Lordships are ready to proceed against the Lord Mayor. That the House of Commons will send a Committee of their House presently, to manage the Evidence against the Lord Mayor. The Committee of the House of Commons being come; the Lord Mayor being brought to the Bar as a Delinquent, Mr. Serjeant Wylde proceeded in the Evidence. The Fifth Article, "for a Contempt, in not calling a Common Council in London, according to the Order of both Houses, for putting the Magazine that came from Hull into convenient Places in London." Sir Tho. Atkins, Alderman, "That an Order of both Houses came to the Committee for the Militia, to lay up the Arms and Ammunition; to that End, a Common Council was to be called; and he and others repaired to the Lord Mayor, and shewed him the Order; and he said, he would acquaint the Aldermen with it, but no Common Council was called until Ten Days after." Alex. Normington deposed, "That the Committee for the Militia did send to the Lord Mayor, to call a Common Council, according to the Order of both Houses; and he said, he would acquaint his Brethren the Aldermen therewith; but a Common Council was not called until Eight or Ten Days after." Russell deposed to the same Effect. Next he proceeded to the Proofs, "That the Lord Mayor had his Hand in contriving a Counter Petition against the Ordinance of Parliament, and procured Hands to it." Henry Davison said, "That he received, on a Friday Night, a Paper from the Lord Mayor, who bid him to carry it to the Recorder, which he did accordingly, who liked it well. And afterward he did to Mr. Benyon and Mr. Gardner." That he was entreated by some Gentlemen to write some Names that were to be sent for, to subscribe the Petition; but he cannot remember who gave him the Directions, and cannot remember he delivered that Note to Fetherby." Ricd. Fetherby said, "He had that Note of Names delivered to him by one Nevill, but knows not the Names, nor the Business. Mr. Benyon was there when he received the Note." Robert Mychell said, "He knows nothing of the Petition which was to be presented to His Majesty: That there was Directions given to Mr. Wiseman, for the drawing of a Petition to both Houses; no Directions from the Lord Mayor, but by the Court of Aldermen. When Captain Ven moved for the settling of the Militia in the Common Council, he conceived that the Lord Mayor did decline it." 1. 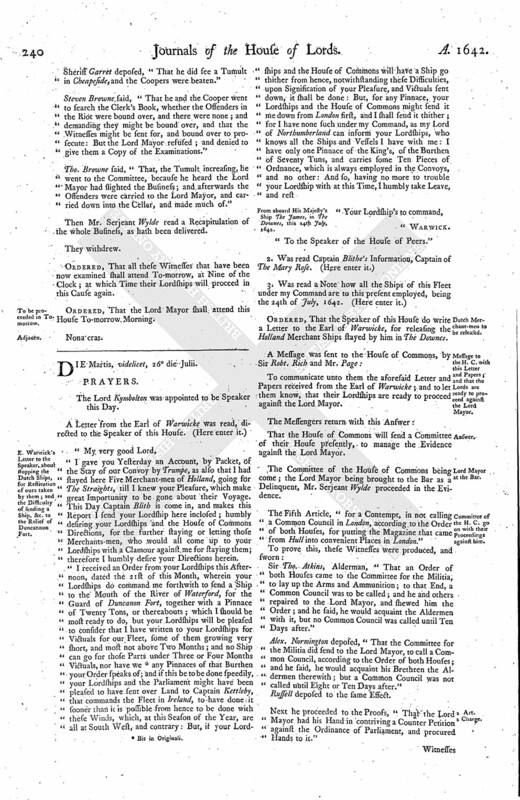 The Counter Petition against the Ordinance of the Militia, which was made by both Houses upon such great Consideration and just Occasions, merely for the Safety of the King and the Kingdom, and in particular having an Eye of the Safety of the City of London; but nothing done without a Committee of theirs, which they should consent to, and did consent to. This Ordinance was offered to the Lord Mayor; and he refused it, because it was his Design to make a Division in the City. The sending of this Petition to divers to subscribe, shewed he did do it with a malicious Intent. 2. Part of the Charge, concerning the Prentices Petition, to be delivered to both Houses of Parliament; which, by indirect Means, was got into the Lord Mayor's Hands, who kept it from them, and gave them ill Language, and imprisoned them. 3. Part, was the Matter of the Riot. 4. Part, the not calling a Common Council, according to the Order of both Houses. 5. Part, the proclaiming the Proclamation for the Commission of Array. "The Resolutions of both Houses, 28th June, concerning Illegality, were printed and published." This being ended, both Sides were commanded to withdraw. Ordered, This House will proceed to hear the Lord Mayor's Counsel on Thursday Morning next. Because it was now late, this House appointed this Report to be made in the Afternoon, at Three a Clock. The Lord Kymbolton was appointed Speaker this Afternoon. To desire their Lordships to concur with them in an Order of Indemnity. Ordered, That this Order be printed and published. Whereas one Mr. Nicholls is taken and imprisoned in Cornewaile, upon a Suspicion that he was Mr. O Neale, but it appears for certain that he is the only Son of one Mr. John Nicholls; the House of Commons desires that their Lordships would join with them, that he may be released, and set at Liberty. Henry Willis said, "He heard Jo. Escott say, he hath not known a Parliament proceed so basely as this Parliament did; and averred what he had deposed in his Affidavit." Nettle said, "He heard Mr. Escott say, this was the basest Parliament that ever was; and they were a Company of Roundheads." 1. That John Escott shall pay to the King One Hundred Pounds Fine. 2. That he shall stand upon the Pillory in Cheapeside, and The New Palace at Westminster, with a Paper on his Head, declaring his Offence. 3. That he shall pay Ten Pounds to Nettle, for his Charges. 4. That he shall be imprisoned in Newgate, during the Pleasure of this House. 5. That he shall find sufficient Sureties for the good Behaviour, when this House shall think fit to release him; and that he shall stand publicly, with a Paper on his Head, expressing his Offence, at the next Quarter Sessions to be holden for the County of Cornewaile after his Releasement." The said Jo. Escott was brought in as a Delinquent; and, having kneeled until the Speaker bid him stand up, the Speaker, by the Directions of the House, Pronounced the said Sentence against him. A General Order for Indemnity of those Persons that have or shall exercise and train themselves as Voluntiers, was read, and approved of by this House; and Ordered, To be sent down to the House of Commons, by Sir Robt. Rich and Mr. Page, to desire the Concurrence of the House of Commons therein. A Relation was read, sent out of Warwicke, concerning some Passages of the Lord Brooke, in executing the Militia, and opposing the Commission of Array. And the Indictment of the Lord Brooke, at the Assizes, was read. The House taking this as a great Breach of the Privilege of Parliament, Ordered, That Robert Leigh, chief Actor in this Business, shall be sent for, as a Delinquent. 3. An Order to pay Solomon Smith his Charges, for the keeping of the Magazine that came from Hull. That this House agrees to all the Orders now brought up from the House of Commons. Upon Information given to this House, "That the Bishop of Ely is gone down into the Isle of Ely, and hath Powder brought to him there, which is a Place of Strength, and of great Importance:" It is Ordered, That the said Bishop of Ely shall be summoned to appear before this House, according to the Condition of his Recognizance. 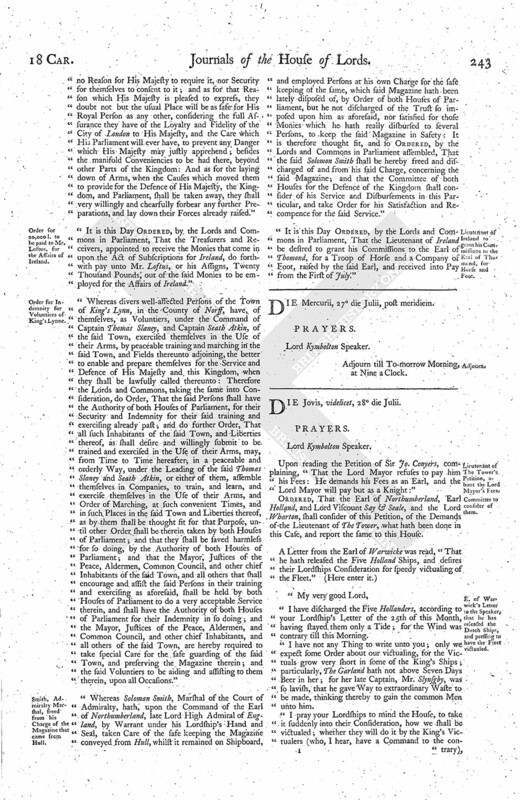 A Message was brought from the House of Commons, by Mr. Waller; who brought up an Answer to the King's Answer to the last Petition of both Houses to the King, wherein they desire their Lordships Concurrence. Ordered, That this House agrees with the House of Commons in this Answer to be sent to His Majesty, as it comes up from the House of Commons. Ordered, That the Speaker of this House do write a Letter to the Lord Viscount Faulkland, to desire him to present this Answer to the King, from both Houses. The Lords and Commons now in Parliament assembled, having received Information of a printed Paper, intituled, A Declaration, or Resolution, of the County of Hereford; and observing how full it is of Sedition, and how scandalous to the just Proceedings of both Houses of Parliament, but not finding any Person to avow it; have Ordered, That the said Declaration be forthwith sent to Sir Edward Henden, Knight, One of the Barons of the Exchequer, and One of His Majesty's Justices of Assize for that County; and that, at the next Assizes there, he cause the said Declaration to be read, in open Court, to the Justices of Peace and Grand Jury; and that he require particularly of them a direct and positive Answer, whether any of them will avow the said Declaration and Resolution; and, if any shall, that then he forthwith certify their Names that so avow the same, to the Lords and Commons in Parliament; and further, that he endeavour to inform himself what Public Proceedings were at the last General Sessions of the Peace for that County, concerning the said Declaration, and certify the same likewise to the Lords and Commons in Parliament." 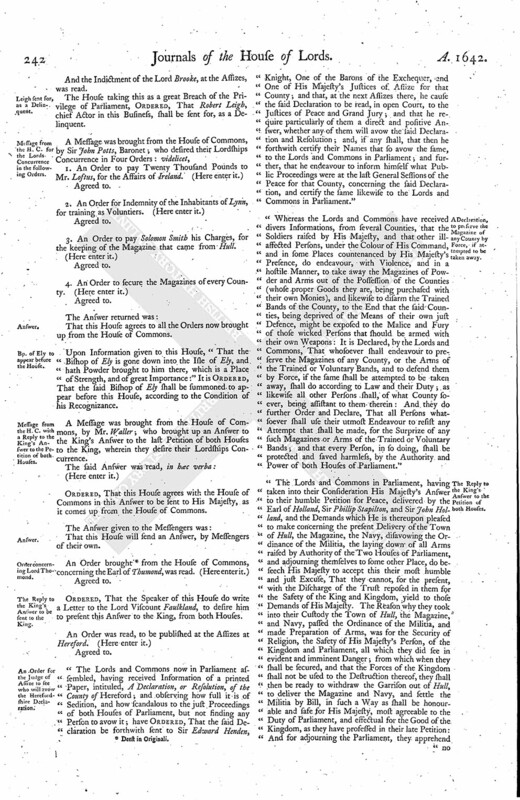 "Whereas the Lords and Commons have received divers Informations, from several Counties, that the Soldiers raised by His Majesty, and that other illaffected Persons, under the Colour of His Command, and in some Places countenanced by His Majesty's Presence, do endeavour, with Violence, and in a hostile Manner, to take away the Magazines of Powder and Arms out of the Possession of the Counties (whose proper Goods they are, being purchased with their own Monies), and likewise to disarm the Trained Bands of the County, to the End that the said Counties, being deprived of the Means of their own just Defence, might be exposed to the Malice and Fury of those wicked Persons that should be armed with their own Weapons: It is Declared, by the Lords and Commons, That whosoever shall endeavour to preserve the Magazines of any County, or the Arms of the Trained or Voluntary Bands, and to defend them by Force, if the same shall be attempted to be taken away, shall do according to Law and their Duty; as likewise all other Persons shall, of what County soever, being assistant to them therein: And they do further Order and Declare, That all Persons whatsoever shall use their utmost Endeavour to resist any Attempt that shall be made, for the Surprize of any such Magazines or Arms of the Trained or Voluntary Bands; and that every Person, in so doing, shall be protected and saved harmless, by the Authority and Power of both Houses of Parliament." 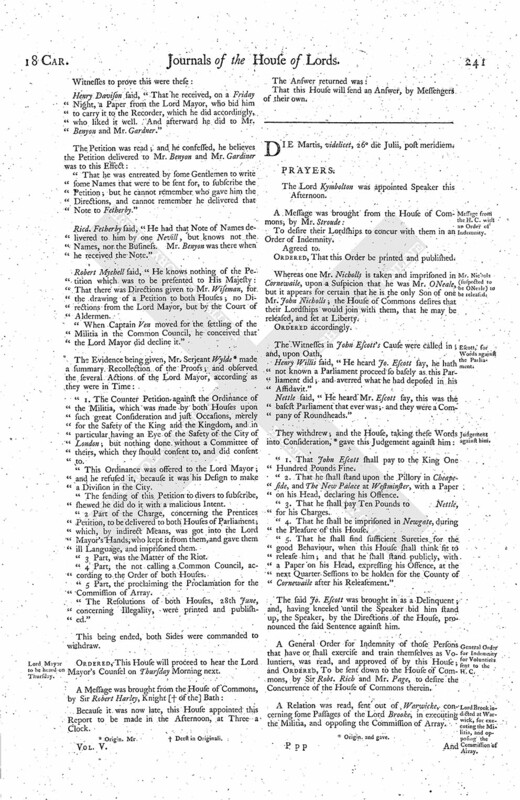 The Lords and Commons in Parliament, having taken into their Consideration His Majesty's Answer to their humble Petition for Peace, delivered by the Earl of Holland, Sir Phillip Stapilton, and Sir John Holland, and the Demands which He is thereupon pleased to make concerning the present Delivery of the Town of Hull, the Magazine, the Navy, disavowing the Ordinance of the Militia, the laying down of all Arms raised by Authority of the Two Houses of Parliament, and adjourning themselves to some other Place, do beseech His Majesty to accept this their most humble and just Excuse, That they cannot, for the present, with the Discharge of the Trust reposed in them for the Safety of the King and Kingdom, yield to those Demands of His Majesty. The Reason why they took into their Custody the Town of Hull, the Magazine, and Navy, passed the Ordinance of the Militia, and made Preparation of Arms, was for the Security of Religion, the Safety of His Majesty's Person, of the Kingdom and Parliament, all which they did see in evident and imminent Danger; from which when they shall be secured, and that the Forces of the Kingdom shall not be used to the Destruction thereof, they shall then be ready to withdraw the Garrison out of Hull, to deliver the Magazine and Navy, and settle the Militia by Bill, in such a Way as shall be honourable and safe for His Majesty, most agreeable to the Duty of Parliament, and effectual for the Good of the Kingdom, as they have professed in their late Petition: And for adjourning the Parliament, they apprehend no Reason for His Majesty to require it, nor Security for themselves to consent to it; and as for that Reason which His Majesty is pleased to express, they doubt not but the usual Place will be as safe for His Royal Person as any other, considering the full Assurance they have of the Loyalty and Fidelity of the City of London to His Majesty, and the Care which His Parliament will ever have, to prevent any Danger which His Majesty may justly apprehend; besides the manifold Conveniencies to be had there, beyond other Parts of the Kingdom: And as for the laying down of Arms, when the Causes which moved them to provide for the Defence of His Majesty, the Kingdom, and Parliament, shall be taken away, they shall very willingly and chearfully forbear any further Preparations, and lay down their Forces already raised." "It is this Day Ordered, by the Lords and Commons in Parliament, That the Treasurers and Receivers, appointed to receive the Monies that come in upon the Act of Subscriptions for Ireland, do forthwith pay unto Mr. Loftus, or his Assigns, Twenty Thousand Pounds, out of the said Monies to be employed for the Affairs of Ireland." "Whereas divers well-affected Persons of the Town of King's Lynn, in the County of Norff, have, of themselves, as Voluntiers, under the Command of Captain Thomas Slaney, and Captain Seath Atkin, of the said Town, exercised themselves in the Use of their Arms, by peaceable training and marching in the said Town, and Fields thereunto adjoining, the better to enable and prepare themselves for the Service and Defence of His Majesty and this Kingdom, when they shall be lawfully called thereunto: Therefore the Lords and Commons, taking the same into Consideration, do Order, That the said Persons shall have the Authority of both Houses of Parliament, for their Security and Indemnity for their said training and exercising already past; and do further Order, That all such Inhabitants of the said Town, and Liberties thereof, as shall desire and willingly submit to be trained and exercised in the Use of their Arms, may, from Time to Time hereafter, in a peaceable and orderly Way, under the Leading of the said Thomas Slaney and Seath Atkin, or either of them, assemble themselves in Compaines, to train, and learn, and exercise themselves in the Use of their Arms, and Order of Marching, at such convenient Times, and in such Places in the said Town and Liberties thereof, as by them shall be thought fit for that Purpose, until other Order shall be therein taken by both Houses of Parliament; and that they shall be saved harmless for so doing, by the Authority of both Houses of Parliament; and that the Mayor, Justices of the Peace, Aldermen, Common Council, and other chief Inhabitants of the said Town, and all others that shall encourage and assist the said Persons in their training and exercising as aforesaid, shall be held by both Houses of Parliament to do a very acceptable Service therein, and shall have the Authority of both Houses of Parliament for their Indemnity in so doing; and the Mayor, Justices of the Peace, Aldermen, and Common Council, and other chief Inhabitants, and all others of the said Town, are hereby required to take special Care for the safe guarding of the said Town, and preserving the Magazine therein; and the said Voluntiers to be aiding and assisting to them therein, upon all Occasions." "Whereas Soloman Smith, Marshal of the Court of Admiralty, hath, upon the Command of the Earl of Northumberland, late Lord High Admiral of England, by Warrant under his Lordship's Hand and Seal, taken Care of the safe keeping the Magazine conveyed from Hull, whilst it remained on Shipboard, and employed Persons at his own Charge for the safe keeping of the same, which said Magazine hath been lately disposed of, by Order of both Houses of Parliament, but he not discharged of the Trust so imposed upon him as aforesaid, nor satisfied for those Monies which he hath really disbursed to several Persons, to keep the said Magazine in Safety: It is therefore thought fit, and so Ordered, by the Lords and Commons in Parliament assembled, That the said Soloman Smith shall be hereby freed and discharged of and from his said Charge, concerning the said Magazine; and that the Committee of both Houses for the Defence of the Kingdom shall consider of his Service and Disbursements in this Particular, and take Order for his Satisfaction and Recompence for the said Service." "It is this Day Ordered, by the Lords and Commons in Parliament, That the Lieutenant of Ireland be desired to grant his Commissions to the Earl of Thomond, for a Troop of Horse and a Company of Foot, raised by the said Earl, and received into Pay from the First of July." Adjourn till To-morrow Morning, at Nine a Clock.